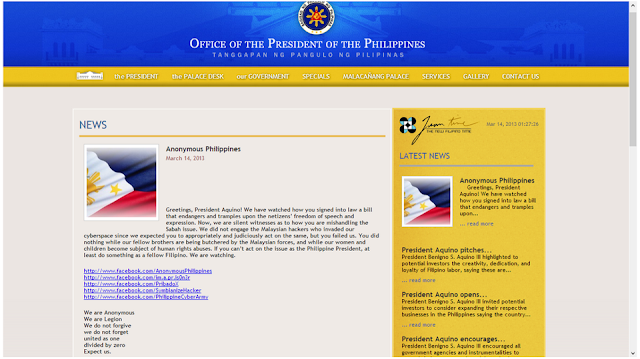 Philippines-Malaysia Cyber war over Sabah land dispute take another turn, when Philippines hackers deface their own President Benigno Aquino III website early Thursday, and criticized how the President has been handling the conflict in Sabah. The hacker group left a message to the president on the defaced Web site and links to Facebook profiles of the hackers, as shown in screenshot taken. Greetings, President Aquino! We have watched how you signed into law a bill that endangers and tramples upon the citizenship freedom of speech and expression. Now, we are silent witnesses as to how you are mishandling the Sabah issue. We did not engage the Malaysian hackers who invaded our cyberspace since we expected you to appropriately and judiciously act on the same, but you failed us. You did nothing while our fellow brothers are being butchered by the Malaysian forces, and while our women and children become subject of human rights abuses. If you can’t act on the issue as the Philippine President, at least do something as a fellow Filipino. We are watching.